Welcoming a new baby into the family often means getting together in large groups with family and friends. It’s a wonderful thing to share your little bundle of joy with those nearest and dearest to you. There is always a plethora of expert baby cuddlers willing to take baby off your hands, leaving you free to do novel things like sit and eat a meal with utensils, enjoy a conversation or visit the bathroom (it’s the little things!). Often this is the first time baby has been exposed to such intense stimulation. With all this highly concentrated activity there is real potential for baby to become overstimulated. Fortunately there are things you can do to avoid this without it taking a toll on you, your family or your baby. Infant overstimulation can occur when baby is exposed to more noise, activity, touch or excitement than they can process. Basically, they have reached sensory overload. Babies may display stress cues like crying, avoiding eye contact, rapid or jerky movements, waving arms or kicking legs more violently, flaying their body about or their vocalisation may shift from coos of contentment to more abrupt and urgent sounds. If baby becomes overstimulated this may translate into difficulty settling or calming baby in order to feed or get them to sleep. Sleep patterns may be disrupted for a day or two (sometimes longer) which impacts on you and the whole family. Observe baby’s cues: As baby is being passed around, periodically check in and observe baby’s cues and mood. If you feel baby is showing signs of stress, pick baby up, hold them close and give them some time with you. You’re reassuring them that you are still around and it gives them an opportunity to reorganise. After some time close to you, they may be ready to return to the cuddle circuit. Walk and talk: If baby becomes too overwhelmed by all the activity you can take baby out for a short walk in a baby carrier or pram. Why not take one of the more placid rellies along with you so that you can catch up properly. Take time out for massage: Both you and your baby stand to really benefit from some nice quiet baby massage time. It is paramount that you pay particular attention to baby’s cues, given that there is so much additional activity/stimulation for baby, massage time might end sooner than usual. As long as you are ‘listening’ to baby there is no risk of over stimulation. 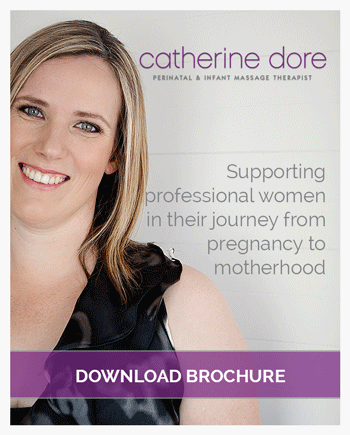 *This article was published in Down to Birth Magazine December 2014. Share your story. Has your baby been overstimulated by a group gathering?